How will the sky look like in a decade? We could have a small, birdlike companion that can land on our shoulder but usually travels half a meter back- and upwards from us, and gives us 360 degee vision through a multispectral camera. It could be like a travel buddy watching your back, helping with navigation, vision and assessing the terrain. 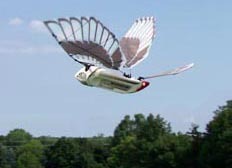 Unmanned aerial vehicles come in many flavours, from the Nano Hummingbird to the Phantom Eye HALE.